Acupuncture is a system of healing that has been practised in China for over 2500 years, it being a form of therapy in which fine, disposable needles are inserted into specific points on the body called Acupoints. According to traditional Chinese philosophy, our health is depen dent on the body’s motivating energy, known as Qi, moving in a smooth and balanced way through a series of meridians (channels) beneath the skin. Qi consists of equal and opposite qualities (Yin and Yang) and when these become unbalanced, illness may result. By inserting fine needles into certain acupoints in the body to adjust or unblock the vital energy (Qi), permits the physical functioning of the body to be restored. There are 365 acupoints on the body. These acupoints are located along the meridians (energy channels) that move Qi throughout the body. Acupuncture balances the energy flow and stimulates spontaneous healing in the body. Modern science has discovered that acupuncture promotes the release of endorphins and positive neurotransmitters in the body. This may explain why patients feel tranquil and sometimes fall asleep during treatments. Traditional Chinese Herbal Medicine is one of the oldest systems of medicine in the world, dating back 5000 years. 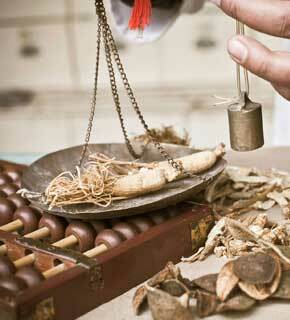 Chinese herbal formulas are a vital component of TCM. Custom blending sets these formulas apart from over-the-counter herbs. Acupuncture and Chinese Herbs work together in driving the healing process. Acupuncture stimulates specific points to release blocked energy and restore its flow while the herbs work at a cellular level. Each formula usually contains 5 to 15 different components. Massage has been used as a therapy for relaxation and healing for thousands of years, being found in a number of ancient cultures, including that of China. In its many and varied forms, massage can play an important role in the preservation and restoration of good health. Whether your are simply seeking relaxation and release from the stresses of daily life, or needing more specific treatment, for chronically tight or painful muscles for example, massage is often found to be of great help. At YanHuang Healthcare, we recognise the important place that massage can have in the maintenance of good health, and the promotion of a feeling of well-being, so we offer several different types of massage therapy, according to the needs of the individual client. Ranging from a traditional Swedish-style Relaxation Massage, through Deep Tissue, Reflexology, and Head, Neck and Shoulder massages, to Chinese Tuina massage, and a Facial Beauty Massage for those looking to achieve a healthier, rejuvenated appearance. To find out more about the various modalities of massage we offer please visit this page. Reflexology is sometimes known as Zone Therapy as the body is divided into different zones represented by a point in the foot or hand. Nerve endings are imbedded in feet and hands that then travel to the spinal cord and to various parts of the body. Traditional practitioners believe that stimulating these nerve ending helps to improve circulation, activate Qi (vital energy) in the body and also promote relaxation and well-being. The Ear Candle is made of natural fabric, wax and bees-wax. It helps revitalise the acupuncture points, stimulate blood circulation and free up clogged pores. Ear Candling is a safe, delicate and non-invasive process. The procedu re involves placing glass cups over specific points on the back and then heating them to create a vacuum. It unblocks lymph nodes along the spine, which in turn helps the body to work more efficiently. Cupping also stimulates tissues to release toxins and activates the veins. Cosmetic Acupuncture is an effective, non-surgical treatment to reduce the signs of aging and revitalize the whole body. It involves the insertion of very thin disposable needles into the acupuncture points on the face. This superficial insertion increases local circulation to the face and stimulates collagen production, filling out the lines and giving firmness to the skin for a glowing, radiant, younger looking complexion. It is much less costly and safer treatment compared to surgery.